What is The Difference Between a Vegan And Vegetarian? When it comes to diets and eating habits one of the biggest questions that gets asked is what is the difference between vegan and vegetarian diets? It is a good, controversial question to ask as these two are very different plans and people who are following either of them will be very serious about what they eat or more important, what they do not eat! This article will explore the similarities and differences between the two diet styles and hopefully, by the end of the article, we will all be able to identify each and the pros and cons of adjusting your lifestyle to accommodate either one. This is as much as a lifestyle and a belief system as it is a diet. Most people who call themselves vegan are referring to much more that just how they eat. This lifestyle is commonly based on one’s view of animal rights and beliefs and has political overtones associated with it. 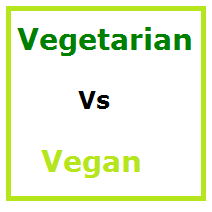 Vegan diets can be defined in three different categories, a strict vegan, lacto-vegetarian, and lacto-ovo-vegetarian. This means people living this lifestyle will not eat anything that is associated in any way with animals. This means any kinds of products that either come from animals or are tested on animals. This means no fish, milk, eggs, poultry, or meat may be consumed. This diet will consist of pretty much the same as the Strict one with the exception that lacto-vegetarians will eat dairy products such as yogurt and milk. This diet will also be pretty close to the same as the strict with the addition of eggs and dairy products are allowed to be eaten. Fruits and Vegetables: Three to four servings of fruit and five to seven servings of vegetables is common. Proteins: Beans, nuts, and soy are great sources of protein. Iron is found in dry beans, spinach tofu, soybeans, peas, lentils and fortified oatmeal. Five servings of each group is recommended. Fats: Two servings of healthy fat should suffice consisting of omega-3 fats from nut butter, canola oil or seeds, and nuts. For more ideas on high fat foods that are good for you, see the Eat Fat, Get Thin plan. Another fact about this type of lifestyle is many people who follow this also avoid any animal based cleaning products and or clothing made from animals. This also will include any product that is in any way tested on animals. It is important to not confuse this lifestyle with the plant based lifestyle as they can be similar in how they eat but there are large differences in their belief systems. Basically a vegetarian is very similar to being a vegan. This plan will also exclude meat, seafood, and poultry. Some will eat eggs and some will not and the same goes for dairy and seafood products. The rest of their diet will be very much similar to the vegan diet above without the political associations or the animal rights issues. Is Using Supplements on these plans allowed & wise? The simple answer to this is yes. For example, because vitamin B-12 is found mostly in animal foods and it is vital in the body to combat depression, fatigue, anemia and it is also vital for the creation of red blood cells and proper brain functions so it is vital to make sure your body is getting enough of this vitamin. It is wise to include a daily supplement to make up for any lost B-12 from lack of animal food, and maybe an all-purpose multi-vitamin for all around good health would also be wise. By following the proper servings and making sure you get the required nutrients and fats in your daily intake converting to one of these two types of lifestyles will have huge benefits in not only a healthy weight management but also in all around health. Many types of health issues like high blood pressure, heart health and diabetes can be eliminated by eating right. Another great plan known to help combat those 3 particular conditions/diseases is the DASH diet. There have been people who have changed their lifestyle plant-based food intake and have eliminated the need for taking many medications associated with unhealthy eating. There have been many reports of broken bones associated with this type of lifestyle and in our research, we have found that as long a person consumes a minimum of 525 MG of calcium a day, all should be well as far as bone strength and development is concerned. Another worry that is associated with both lifestyles is the lack of vitamin D consumption. This can be put to rest by eating plenty of vitamin D-fortified cereals, margarines, and soy beverages. As mentioned above a good multi-purpose vitamin a day will also help combat any loss of vitamins and iron lost from not eating animal based foods. Should anyone go on either plan/lifestyle? The choice of which direction to go with your eating and lifestyle habits can determine whether you become a vegetarian or a vegan. Your belief system will have a huge part in your decision and once made you will be well on your way to a healthy lifestyle. People who have made the switch have reported less sick days, more energy and an all around better mental outlook of their surroundings. They claim to live in the positive and seem to happy and healthy often. Some have even reported the reversal of heart issues, digestive issues, and diabetes with many completely eliminating associated medicines. Although other plans that mix in meat, fish and poultry, something frowned upon by these diets can also bring up healthy changes. Personally, I am not in either category and believe in eating foods that are of different groups. Since the beginning of mankind, we have eaten this way and in my personal opinion, trying to become a herbivore or something of a quasi herbivore (basically that’s what we’re doing) is unnatural and there is evidence which suggests it may not be manageable. One thing I will absolutely agree with any vegetarian and vegan proponent on is the part about animal cruelty. If I know that a certain food was made through the torture and suffering of an animal, I will avoid eating it (veal for example). I also am the type who believes that even plant based foods are also lifeforms. In short, my belief is more of an in between. As long as the food we eat is humanely gathered and is healthy, I will eat it. Thank you for the article. Finally, I think I can understand the differences between being vegan and vegetarian which are minimal. Otherwise, I do respect who decide to become vegetarian or vegan, but I think they lack some important nutrients like the animal protein which is important for the Skeletal muscle and the immune system. This was a very informative article and I enjoyed reading it very much. I always wondered the difference between vegan and vegetarian and I guess like you said they are almost the same except their beliefs about animals. When you eat meat are you health conscious and try to boil or bake your food — or do you not really care too much and just eat it however it is?